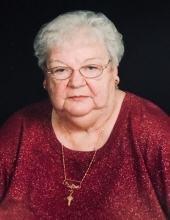 Pauline Byrd Patton, 77, of Amherst passed away Monday, November 26, 2018 at her home following a courageous, 12 year battle, with cancer. Born in Fries, Virginia, May 25, 1941, Mrs. Patton was the daughter of the late Oscar Raymond and Gladys Farmer Byrd. She was former owner of Patton Photography and was a member of Emmanuel Baptist Church, Sandidges Road, Amherst. Survivors include her husband of 62 years, L. C. Patton, Jr. of Amherst; daughters: Sharon P. Massie and husband, Samuel P. Massie Jr. of Vesuvius and Teresa P. Tatlock of Amherst; brothers: Bobby D. Byrd and wife, Shirley of Galax and Raymond “Bud” Byrd and wife, Linda of Danville; grandchildren: Brittney T. Patton and husband, Blayne of Roanoke, Robert K. Tatlock, Jr. and wife, Krystal of Amherst and Kody W. Tatlock of Amherst; great-grandchildren: Kaylynn Tatlock, Kellsey Tatlock and Stone Patton and several nieces, nephews and friends. In addition to her parents, she was preceded in death by her son-in-law, R. Karl Tatlock, Sr.
Funeral services will be held at 11:00 am, Wednesday, November 28, 2018 at Driskill Funeral Chapel, Amherst. Interment will follow in Amherst Cemetery. The family will receive friends from 10:00 am until 11:00 am, Wednesday at the funeral home. The family wishes to thank Centra Hospice and all the wonderful Friends, Neighbors and other Caregivers for all of their loving assistance during her illness. To send flowers or a remembrance gift to the family of Pauline Byrd Patton, please visit our Tribute Store. "Email Address" would like to share the life celebration of Pauline Byrd Patton. Click on the "link" to go to share a favorite memory or leave a condolence message for the family.